The Castillo Hotel Son Vida is in a unique setting of a 13th century medieval castle, surrounded by 500 hectares of sub-tropical parkland with magnificent views over the Bay of Palma and two eighteen-hole Golf Courses, one of which is exclusive for Hotel guests. The Hotel is modernised with select, elegant decoration and combines the quality of its establishment together with good taste and excellent service in order to make your stay unforgettable. The Castillo Hotel Son Vida is a member of The Leading Hotels of the World. The name Son Vida comes from the Majorcan phrase “som d’en Vida”. The surname Vida arrived in Majorca with the Conquest by King James I in 1229. the original Son Vida Castle was built by the Marquis de la Torre in 1901 as a token of his affection for his wife. The art gallery is outstanding with paintings by Ricardo Ankermann, Fausto Morrell, Francisco Maura and Antoni Ribas, also there is a collection of antique weapons. 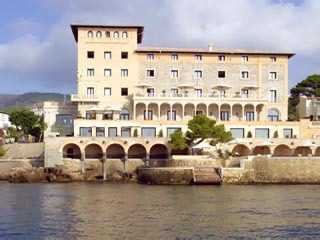 During their visits to Majorca, Son Vida Castle was the residence for many famous people, such as Edward VII of England, the Infanta Isabel and the President of the Spanish Government in 1906, Antonio Mauro. Until 1961, during which the inauguration of the Hotel took place and was attended by members of Monaco’s royal family, Aristotle Onassis and Maria Callas, among other personalities. High above Palma, in the noble estate of Son Vida, sits the Castillo Hotel Son Vida enthroned on the hill. The hotel is a realized architectural dream. 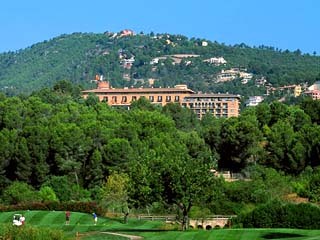 Subtropical parks, the golf course Son Muntaner and the championship golf course Son Vida surround the elegant castle. The capital city of Palma is 5 minutes by car. 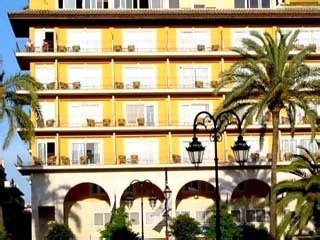 The transfer from Son Sant Juan airport to the hotel takes approximately 15 minutes by car. Since its first day in 1961 the Castillo Hotel Son Vida has stood as a discreet refuge on the most famous and biggest island of the Balearics. Some of the guests are longing for their island shelter. Park Rooms Tender yellow and blue colours set a refreshing contrast to the greenery before the guestrooms: the park with sub tropical gardens. Like all the rooms and suites, the most modern technology is hidden behind the traditional and elegant furnishings, such as a DVD player, High-Speed Internet access and Wireless LAN to name the most important ones. In addition, a luxurious bath with two basins, shower and bathtub as well as the most distinguished bath accessories. Grand Deluxe Rooms Grand Deluxe room from the fourth to the seventh floor promise a little more luxury and room. They are located on the front side of the castle, have a balcony or French window and a spectacular view over the bay of Palma. On request and at a supplement, Butler service is available for the guests on the seventh floor. Family Suite Arranged three of the suites especially for families. They enclose two bedrooms and extend at different levels. From the balcony of the Family Suite you have a view to the park. Classic Suite Endless greens or an inspirational view: On the seventh and eighth floors lies your second home with a spacious bedroom, extra living room and luxurious bathroom enclosed in 80 m². Deluxe Suite All Deluxe suites offer this incomparable view of the bay of Palma. They enclose 100 m² and include one great balcony. Besides a spacious bedroom and a living room you have your own private kitchen. Loewe Suite This suite is unique in the world. The designer Carvajal has designed it for the Spanish brand LOEWE. Dark wood, noble Travertino and Calatorao natural stone and modern photographic works give transparency and broadness to the suite. They have been connected with the traditional leather elements for which LOEWE attained world fame. Equally extraordinarily: the elated view of the terrace on the island’s capital of Palma, the bay and yacht harbors, the wide sea and the greens of both the golf courses Son Vida and Son Muntaner from this suite. The magnificent LOEWE style living accommodations completed with a petite but exclusive Gaggenau kitchen and a separate toilet, spread at approximately 100 m². The single areas can be separated with glass sliding doors and darkened with wooden sliding doors placed behind them. The bathroom has been integrated as an open space into the suite. Besides the luxurious furnishings with Jacuzzi and steam bath you can enjoy the equipment specially made for this bathroom. High speed Internet-access, DVD player and an 82 centimeters wide LCD TV belong to the obvious technical equipment of the LOEWE Suite. Charming service details: Guests of the LOEWE suite are transferred from and to the airport in the Castillo’s own Rolls Royce and are given on arrival an exclusive LOEWE present. A bottle of cava and fresh fruit await you in your suite. Choose among twenty different soap brands and eight unique pillow types. Your personal butler brings the scent of your election to the LOEWE Suite, amongst the many extras – he is available to you around the clock, without supplement. Royal Suite The wonderful Royal Suite extends on more than 132 m² and reflects the personality of the hotel. It comprises one bedroom, a living room and a luxurious bathroom. From the generous terrace, 33 m², you enjoy breathtaking views over the bay of Palma and the golf courses Son Vida and Son Muntaner. The Royal Suite can be connected and expanded with a Grand Deluxe room. Villa Suite Castillo atmosphere on two floors: Almost 300 m² the Villa Suite with an additional 50 m² spacious terrace with garden view, next to the sixth hole of the Son Vida golf course. All four bedrooms with own bathroom each – among them the 50 m² Master suite – can be connected with one another. Moreover, the Castillo’s Villa has a living and dining room that include a table for up to twelve persons, an office, a private gymnasium with sauna and steam bath included as well as a private pool and garden. The private parking space and the private entrance to the luxurious rooms of the Villa Suite are at ground level. An elevator and a staircase connect both floors. Guests of the Villa suite live independently from the hotel if desired. A state of the art security system cares for your safety. Charming service details for Villa guests’: you are transferred from and to the airport on the Castillo’s own Rolls Royce.An extra detail: You can select among twenty different soap brands and eight unique pillow types. Immerse into the world of the Castillo’s Beauty Spa and its stimulating pools and sauna landscapes. Let yourself be pampered and get pleasure from an invigorating massage, a beauty treatment or unwind your soul under the afternoon sun by the pool. Pool & Garden Recover yourself from an invigorating bath or some swimming strokes under the shade of old venerable palms and pine trees. Comfortable sun loungers, an attentive service, superior drinks and snacks and the picturesque view to Palma lie head on to the wooden planks surrounding the swimming pool. Indoor pool Within the spacious winter garden lays the indoor pool. 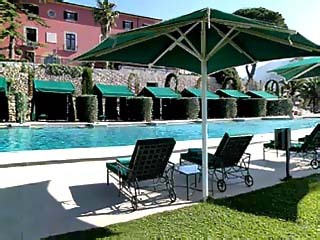 Adjoining the pool, you will find the whirlpool, sauna, steam bath, cold water grotto and a solarium. Numerous fluffy bath towels and robes are organized for you. Sauna Within the spacious winter garden lays the indoor pool. Adjoining the pool, you will find the whirlpool, sauna, steam bath, cold water grotto and a solarium. Numerous fluffy bath towels and robes are organized for you. Fitness Room Biceps, triceps, belly or back exercises? In here, you will find the precise machine for each muscle group. Upon request, it is tailored your personal training plan according to your goals and needs. Do you prefer to exercise outdoors in the fresh air? Benefit from the hotel’s own tennis courts with the option of your own personal instructor. Ask for the daily sports program, which it is offered from 8.00 until 16.00 hours. Sport What is more restful than some golf swings or tennis sets under the Mallorcan sun? Thanks to the mild Mediterranean breeze that softly blows over the island, your body temperature remains under control even during the most challenging game. Whether you wish to improve your golf swing or strengthen your tennis stroke, at the Golf Academy or at the Tennis Club, you are in the best hands. Tennis: Between Palm trees and semitropical vegetation of the Castle’s park, lay four tennis courts, from which you can choose between quartz sand floor and hard floor. For night time athletes, we will gladly switch on the floodlights. A tennis instructor is also available to you upon request. Arte Homage to Spain’s grandeur and the Castillo Hotel Son Vida’s history are the precious antiques and valuable paintings of significant artists that adorn the rooms and suites of the hotel. A walk by the glass dome and the hallways resembles a visit to a private art collection. Bellver Restaurant is the main Restaurant of the Hotel and offers splendid views over the Bay of Palma and an international cuisine. El Jardin Restaurant is an a la Carte gourmet Restaurant. Grill Restaurant operates in the open air during the summer in the Swimming Pool area. Les Chaxnes des Rotisseurs: An important gastronomic organisation, founded in Paris in 1950, dedicated to promoting the appreciation of fine cuisine and friendship, La Chaxne is based on the traditions and practices of an old-established association of Carveries, whose origins and practices date from the year 1248. At present, this organisation boasts members in over 110 countries all over the world. Our country has 25 guilds and over 100 members. Our Director, Mr Federico Marνn, and our Executive Chef, Mr Jaime Durαn, are both members of this association. Bar Armas: A Piano Bar with terrace and views over Palma Bay.